Apologies for the lack of updates. 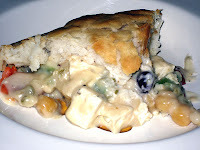 But I'm going to jump right in and post my dinner for yesterday--Tofu Pot Pie! Didn't have a special recipe for this... just modified the Impossibly Easy Chicken Pot Pie recipe over at bettycrocker.com. First, I used the Heart Smart Bisquick instead of regular. And, I substituted Ener-G's Egg Replacer for the real egg. Then, for the pot pie recipe, I substitute cubed tofu for the chicken, 98% fat-free cream of celery condensed soup in place of the cream of chicken soup, and I used a frozen vegetable mix which had kidney beans and chick peas in it. :) I baked as directed and mmmmmmm... yummy pot pie! I've used this recipe before, but alway just omitted the chicken instead of trying to substitute it. I must say, I was pleased with the Tofu Pot Pie version!